This is the "Bluevolution" finish. Yes, really. Nearly a year after it was announced, Gibson's Firebird X will finally ship to retail this Friday September 30. The self-styled super-guitar features an in-body effects processing system and "fourth-generation" robot tuners. Intriguingly, the Pure-Analog processing engine is also open to third-party developers. Check out our full review of the Firebird X.
Nashville, Tennessee: On Friday September 30th 2011 Gibson Guitar Corp will take guitar engineering to new heights with the introduction of the Gibson Firebird X (www.gibson.com/firebirdx). An evolution of the 1960s classic Gibson Firebird model, the Firebird X is loaded with ground-breaking technologies like fourth-generation Robot tuners for automatic tuning, onboard effects based on computer plug-in technology, and wireless Bluetooth pedals for unsurpassed usability on stage and in the studio. In addition, the Gibson Firebird X is designed for compatibility with hardware and applications developed by third party companies-an industry first. Gibson's "Pure-Analog™" Engine makes this possible in conjunction with an authorized App store, where vendors can sell Gibson-compliant applications. Limited to 1,800 models in two unique finishes - Redolution and Bluevolution - the Gibson Firebird X will retail for $5,570 msrp. "Innovation has always been the driving force at Gibson, and the Firebird X is nothing short of groundbreaking," says Henry Juszkiewicz, Gibson Guitar Chairman and CEO. "The Gibson Firebird X is truly the most technologically-advanced guitar ever conceived, with multiple built-in effects that take sonic capabilities to an entirely new level-while retaining the classic appeal of a finely-crafted, supremely playable instrument." As an added bonus, all registered owners of the Firebird X gain instant entry into the Firebird X Visionaries Club, an on-line community where members have exclusive access to software, patches, manuals and other supporting downloads. In addition, members can create and maintain personal profile pages; post and share Firebird X preset files, audio and video content; and communicate/interact with fellow Firebird X owners, artists and Gibson staff. The Gibson Firebird X has a lightweight body (six pounds total) made from hand-sorted swamp ash; a thin, fast, asymmetrical rock maple neck with a smooth, non-stick satin finish; and a maple finger board. Gibson has also developed the unique ProX case to protect the instrument, with the ability to survive a fall from a sixty-foot building. Built-in effects capability, accessible with a minimum of motion and disruption, enable users to simply morph settings and switch into different effect. Presets recreate the world's best tones and generate a plethora of new ones. With a fourth generation of supporting hardware and software the Gibson Firebird X is self-tuning, allowing the guitar to change tunings quickly and accurately. Designed to look like standard pickup selectors, the two "tog-pots" have control built into the rotatable toggle shaft to let users morph smoothly from unprocessed to processed sounds. A third "tog-pot" blends acoustic sounds from the piezo pickup, along with the electric pickups or only acoustic sounds. Optimized to sound like Gibson's acclaimed J-45 acoustic guitar, the basic acoustic guitar sound is virtually indistinguishable from an acoustic guitar's electric output. Three mini-humbuckers with side-by-side coils and a hexaphonic piezo bridge pickup with an improved low noise, high dynamic-range preamplifier make the Firebird X a fully active guitar. The bridge piezo pickup includes hex outputs (each string can provide a separate output for computer or live performance setups), which allow everything from totally new sounds from "clean" distortion and synth-like timbres to sophisticated surround possibilities. Thanks to advances in low-power circuitry, greater Robo-Tuner efficiency, and power saving technologies adapted from laptop computers, the Firebird X internal battery lasts for over two hours of continuous use and, if needed, can be swapped out in seconds with a readily available camcorder battery. Gibson partnered with CSR, a global leader in wireless technology, to develop an expression pedal and footswitch unit (included with purchase) for the Firebird X. "CSR combined our unsurpassed Bluetooth connectivity technology and expertise with our passion for creativity to make Gibson's vision a reality," says Anthony Murray, CSR Senior Vice President of Audio and Consumer Business. "The result is an amazing system that enables players to experience precise, intuitive control of the instrument with absolutely no wires to get in the way." Optimized for musical applications, the pedals and footswitch snap together for a secure mechanical and electrical connection to create a compact pedal board setup. Although the heart of the distortion options within Firebird X use McDSP's critically-acclaimed Chrome Tone plug-in, Gibson engineers included multiple modulation, delay, and reverberation effects including new effects like "dynamic" delay and old favorites like spring reverb, analog chorus/delay, and a 10-second looper. The Firebird X features Gibson's turbo-charged "Pure-Analog™" engine, which provides an arsenal of professional world class sounds and effects as well as professional analog sound. It is user-replaceable, and allows 3rd party developers to make new exciting use of the engine by allowing their software, sold in the Gibson app store, to run on the guitar's engine. 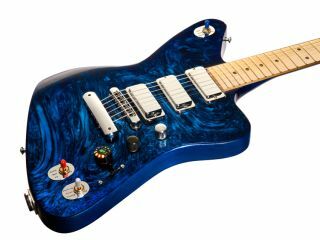 For more information on the Gibson Firebird X and to find the nearest dealer, please visit http://www2.gibson.com/Products/Electric-Guitars/Firebird/Gibson-USA/Firebird-X.aspx.